Check out the Voices Productions documentary on how Dubuque’s streets were transformed with beautiful art. Dubuque is Iowa’s oldest and arguably most charming city. Framed by the natural beauty of the Mississippi River on one side and leafy bluffs on the other. Dubuque sits at a crossroads between its colorful past and its hopefully sanguine future. 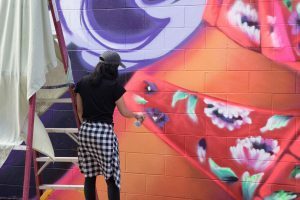 To help express this zeitgeist, Voices Productions has undertaken a public art campaign, focusing its efforts on private property, Voices Productions hopes to trigger cultural vibrancy through the democratic and transformative power of street art. Through 2017, eighteen murals have been completed. Keep up to date with everything Voices Productions by following us on Social Media. Murals, a museum and bluffs define Iowa’s historic city on the Mississippi.